On digital subtraction angiography, “STRING OF BEADS” appearance of arteries is seen in which among the following? 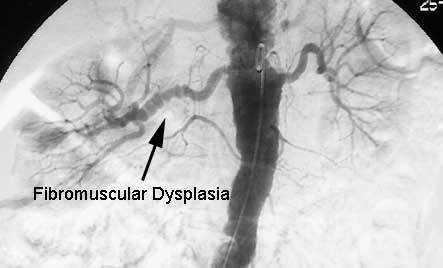 Fibromuscular dysplasia produces segmental medial fibroplasia of large (especially renal, carotid, and vertebral) arteries and is associated with arterial dissection and aneurysms. Familial cases suggest autosomal dominant inheritance with incomplete penetrance. Stroke is most common in children and young and middle-aged adults, especially females. A characteristic “string-of-beads” appearance on angiography is diagnostically helpful. Symptomatic carotid artery disease is usually treated with antiplatelet drugs and intraluminal dilation of the affected vessel.